June Cousens, a grade 4 teacher at Master's Academy & College in Calgary, Alberta, Canada, participated in a project in which her students collaborated with grade 10 students to read, understand, and perform Shakespeare's A Midsummer Night's Dream. The project, as Cousens tells us in this article, was a rousing success -- sparking "an interest level between the two age groups that may not have been there in a single-grade environment." Included: Comments from the kids who participated in the project. Tips for starting your own cross-grade collaborative project. As I browsed Lois Burdett's revised version of A Midsummer Nights Dream, I tried to picture her grade 2 students performing this Shakespearean play. If her second grade students were able to tackle the play, I wondered, why couldn't my grade 4s? What if high school students became part of the initiative? What learning benefits would they bring to the project? Captivated by those considerations, I began a process that opened my eyes to the power of teaming learners across grades. drew up benchmarks, which included background discussions, paraphrasing, and character sketches. created an estimated time frame. arranged each class into ten groups. presented the project idea to each of our classes. matched each group of grade 4s with a group the grade 10s. assigned each combined group a section of the play. Realizing that the success of the project hinged on our students' ability to stay in touch, we decided students would meet twice a week. That presented a slight challenge, as our timetables did not mesh; so the elementary students juggled their lunchtime to be available to meet with the high school students. I first discussed some background information with my grade 4 students -- to help them understand the culture, political interests, and time frame of Shakespeare's play. Then, we read a shortened version of the play. Our grade 10 collaborators studied the entire play, and then helped their younger buddies with the language and vocabulary. Both classes watched excerpts from the movie version of the play. Each group took its section of the play and divided the acting and dialogue as evenly as possible among members of the group. Scenes and dialogue were taken directly from the script. Finally, we enlisted the cooperation of the Grade 10s to ensure that their groups completed this challenging assignment. What the Kids Said "When I found out that we were going to be acting out Shakespeare, I thought it was going to be so hard -- because that's what other people said -- and that I wouldn't understand itbut I showed them! It's like anything; once you get going on it, it becomes more and more easy to understand." "I liked when everybody used expression because it made the play sound better! It took a lot of courage to stand in front of 100 people and say lines that sounded funny. I will never forget Shakespeare." "All in all, I really enjoyed reading this play. Working with the grade 4s made it that much more fun, and another good way to make everything even more understandable." "I liked practicing my lines with my grade 10 buddies because it was more fun than at home." "Learning Shakespeare was wonderful, because getting feedback from a child is so imaginative. If there was one thing that these children taught me, it was that imagination should dominate your mind and let it be a place to escape from realitya place where happiness can occur -- no stress." "I liked when we got to dress up; and when we got to say Shakespearian language, I LOVED it! Shakespeare rules!" Click here to read more student comments. 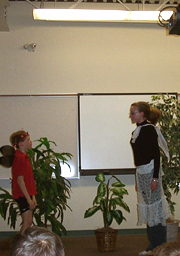 The goals of the project were to create a process folio in which students profiled their groups' learning processes based on the benchmarks; and to act out a short scene from the play, using costumes and accurate characterizations. a mind map outlining the students' initial reaction to the play. a script, in which students highlighted and defined any unclear words in their assigned scenes. Grade 10 students were to use those words to create a test that would demonstrate the grade 4s' understanding of the terms. a paraphrased version of the group's portion of the script, written in contemporary language. evidence from the script used to create character sketches for the characters in the group's scene, including the way the characters acted; what they valued; how they looked; and what they wore. Pictures and sketches were permissible. final student reflections on the process: What did they find most difficult? What tasks were easy to do? What did they learn? Using a step-by-step process, the high school students modeled how to approach and manage the project. We stressed, however, that this was to be a jointproject -- the high school students were not to do everything for the younger students. 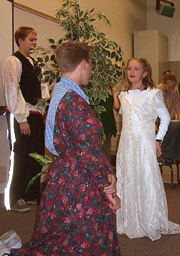 The final part of the assignment was the performance of the play, including the development of costumes and props. To help them with this part of the assignment, students viewed the movie version of A Midsummer Night's Dream. Over a two-week period, students rose to the challenge. They memorized their parts and learned to present their scenes with expression, appropriate gestures, and confidence. On the day of the performance, students and their parents shared a Shakespearean "feast" of sandwiches and desserts prior to the presentation. Hosts and hostesses from grade 4 helped direct guests to the locations of the feast and the play. Of course, not all groups were totally enthusiastic. Some had to be monitored more closely than others; they needed to be reminded to stay on task, and teachers needed to generate a little extra enthusiasm. What a difference an enthusiastic educator makes! Grade 4 students were excited to work with their grade 10 buddies. The high school students went out of their way to follow-through on their leadership commitments. The grade 4s benefited from the individual attention; their explanations of all aspects of the play -- from vocabulary to costuming -- demonstrated an excellent understanding of the meaning of the play. The grade 10s came to a more thorough understanding of the play by teaching their grade 4 colleagues. This project made me realize once again that sometimes the real limitations to improved education are the boundaries of our own imagination. It made me question why we, as teachers, maintain such rigid boundaries between grade level divisions. Do we protect a preconceived notion about what older students want or what younger students are capable of doing? The performance and the excitement generated by my students was truly inspirational! I was often reminded of the adage, "Where there's a will.there's a way." I will remember this play as one of the most rewarding projects I have done with my grade 4 students. "Over the time that we took to learn about Shakespeare, I leaned now to understand the old English language that he wrote his plays in. It wasn't easy at first, but as we kept on learning and reading, it became much easier to understand and read. When I found out that we were going to be acting out Shakespeare, I thought it was going to be so hard -- because that's what other people said -- and that I wouldn't understand itbut I showed them! It's like anything, once you get going on it, it becomes more and more easy to understand." "All in all, I really enjoyed reading this play, and working with the grade 4s made it that much more fun and another good way to make everything even more understandable. By teaching just one specific area of the play, it was good for both grades to see what we understood and to work on the things we didn't understand. By paraphrasing, it really made it easy to teach them what was going on and to act out what kind of drama they had to do -- like if they were mad, or sad, or frustrated -- by using modern insults and expressions. I really enjoyed this unit!" "It has honestly been such a great opportunity to get to work with the grade 4s -- especially Nathan and Matt. I have had so much fun! I am also very surprised to see how much I am adapting the Old English script. When I first started reading the script, I was feeling so much doubt! I couldn't understand how anyone could understand such a foreign thing. But I managed to do OK! Right now I'm very proud of Nathan and Matt for being able to memorize their lines in such a short time. Bravo!" "My experience with the grade 4s has been one of mixed emotions at different times. Overall, I believe it went really well and was a learning and growing experience for all involved. Getting to know Chris and Bailey was great; we became co-workers with them. At first, they seemed to think that we were simply going to be their teachers; hand them assignments and tell them what to do all the time. As we spent more time with them, we developed a working relationship. They then felt that we were simply students trying to do a project too, and we weren't just there to boss them around. They seemed to be genuinely interested in some of the activities we created and used. They appreciated hands-on work and caught on to concepts a lot quicker when that [technique] was used. Other times, it was really difficult to motivate them to work. I learned a lot about the story by having to teach it. It caused me to think of the story in its most simplistic terms, so it would make sense to the grade 4s. Making the story simplistic actually caused me to understand the plot a lot better, even simple honest remarks make by C. and B. from grade 4 brought the play to a new level of clarity. I really enjoyed working with C. and B. and appreciated developing skills to work with a range of talents and abilities. I also enjoyed working with B2. If it had been optional partners, I wouldn't have formed a stronger friendship with her at all. She was great to work with and I think our styles quickly melded together to help C. & B." "This project was very interesting. We certainly made a huge impact on each of the grade 4s lives, and they have done the same for us. We got a chance to learn and interact with younger children and truly remember what it was like when we were in grade 4. In many ways, all of us were flattered by how much these kids look up to us, and we all realized that being a Principle Centered Leader is such a vital skill. It was interesting seeing how the younger students interacted with us. David and Callum built a great relationship, just as Darren, Naomi and Cassandra did with me. Learning Shakespeare was wonderful, because getting feedback from a child is so imaginative. If there was one thing that these children taught me, it was that imagination should dominate your mind and let it be a place to escape from realitya place where happiness can occur -- no stress." "This project was great. Indeed, there were aspects of the project that would need changing, but at the same time it was a project unlike any other. We certainly loved these children and will continue to miss their joy that they brought to us. I believe that these grade 4s planted a seed of love and joy that we will never forget." "I learned that Shakespeare is a cool play and that it looks good when people are acting it out." "I liked working with the grade 10s because I made new friends." "I liked how we got to know each other and I learned how to meet new friends." "I liked working with the grade 10s because I have never acted out a play and worked with a different class or grade." "I liked when we got to dress up and when we got to say Shakespearian language. I LOVED it! Shakespeare rules!" "I liked welcoming the parents and other guests. I learned new words!" "It took a lot of brain work to memorize my lines." "We learned lots from our buddies and even taught them a lot of things. I really liked this unit a lot." "I liked my buddies because they are funny and they help with understanding my work better. I learned that doing a play is a lot harder than it looks, because there is a lot of hard work, commitment, and time that you have to put in." "We had good buddies. I don't know when we'll see them again." "It was very interesting to learn Old English because it was like learning a new language." "I learned how to understand the language. I loved Shakespeare!"